Rev Up Your Metabolism and Get Fit Quick! Custom Nutrition & Exercise Prescriptions. All you have to do to get fit quick is commit! With QuickFitRX you will not need to buy pre-packaged foods. Your meals are affordable and easy to prepare. You never have to eat anything that you do not enjoy. You will experience satiety and not starvation while on our meal plans. Your lifestyle and timing of meals are important cornerstones that makes this program successful. Food plans are considerate of food allergens & intolerances. Gluten-Free, Vegan & other Custom programs are available. You choose how and where you will exercise. All workouts are 30 mins or less….if you want longer workouts, we can provide that for you! Focus on the here and now! Let go of the past and future, so you can learn a path that will help unlock your potential and reach a new pinnacle in your life. You will learn how to maximize your performance, streamline your goals and achieve impressive results. You will live life to the fullest when you look and feel your best! With our guidelines and suggestions, you will develop the mind set that will help you come up with sensible solutions that lead to you making the right decisions long term for your body. Since starting your program, I did not expect to get such great feedback. My doctor informed me that my cholesterol dropped from 230 to 140. My trigycerides have been reduced to almost half of what they were normally. My blood pressure reading was great. I have struggled with weight loss due to diabetes and changing to injecting insulin. This caused a weight gain of 14lbs in one month. This program is so easy for me and with your planning and encouragement this was attainable for me. I have lost 10lbs and three inches in a short period of time and now my Diabetes is manageable. My doctor approved this plan and embraced it as a solution for me. He said once I get to 200lbs I can stop injecting insulin and go back to oral medication. I could possibly stop all meds altogether. I used this program to become a professional cheerleader. I was complimented on how great my body looks! As a Ravens Cheerleader we are suppose to work with a nutritionist and I was given special permission to work use the Accelerator Program. Thank you for making my dreams come true. I have more energy than ever too! After Following Michelle's guidance I lost 18 lbs and 10 inches. She has finally answered a problem that has nagged at me for years. I tried Jenny Craig, Weight Watchers, LA Weight Loss, The South Beach Diet, etc. none were nearly as effective and life changing as this. None have been able to diagnose the problem but Michelle zeroed in on a major area. I was overworking and working against myself in the gym. She takes an individual interest in clients ad is extremely knowledgeable. This program changed my life. I went from a size 10 to a size 4 and lost 15 pounds. I was inspired to become a triathlete. I have been able to apply all that I to my life and have stayed healthy and active even three years after the program. Not only did I gain physical strength, but emotional strength, as well. I now have the confidence to do anything and the changes to my life have been immeasurable. This is an easy to follow nutrition plan with yummy foods to eat and an excellent workout program that was easy to follow. I quickly began to lose weight and see results. At the check-ins she encouraged me to do my best when I thought I couldn't. At the end of the program, I lost around 23lbs. This set the tone for the rest of my life. I gained the tools and learned how to better take care of my body for the rest of my life. I will forever be grateful for the lifelong health this has given me. This program did not just help me with my eating, it addressed my culture as a Hispanic and it included some of my favorite foods. I feel lighter and instantly lost 10 lbs and I see shape in my body like never before. The dietary changes and constantly changing workouts helped me to lose weight (that I just couldn't shed) as well as inches. My body has been totally reshaped. I didn’t think it was possible at my age! 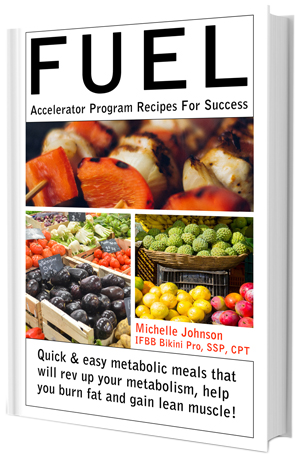 The Accelerator Program helped me learn the importance of not depleting myself of calories to lose weight. What really impressed me is my stomach always looked bloated despite my efforts in the gym and now it is flat. I am seeing tone and shape in my arms like never before and I feel better overall. I can't say enough about this program. I have lost a ton of body fat. I have ben able to keep off the weight because of what I learned. My entire mind set about food and exercise has changed. I even lost additional weight over the next couple of years after doing this program. This is worth every minute working out and dime spent. This changed the shape of my life!! I decided to sign up for this program when I could no longer fit into my clothes. Nothing I was doing was working. Well, I still can't fit into my clothes…. Because they are too big! I was able to lose 30 pounds, gain muscle, lose inches and drop my body fat by 11%. I look forward to maintaining my healthier body!